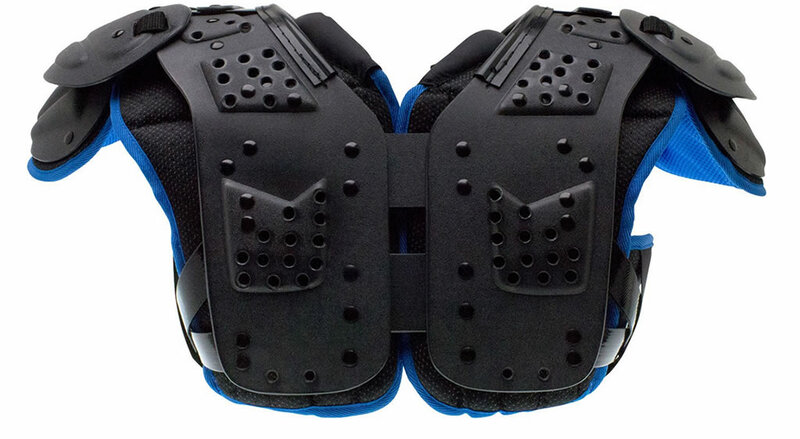 One of the first pieces of gear you need to begin your football practice is a football shoulder pad, which will offer you protection on the field. 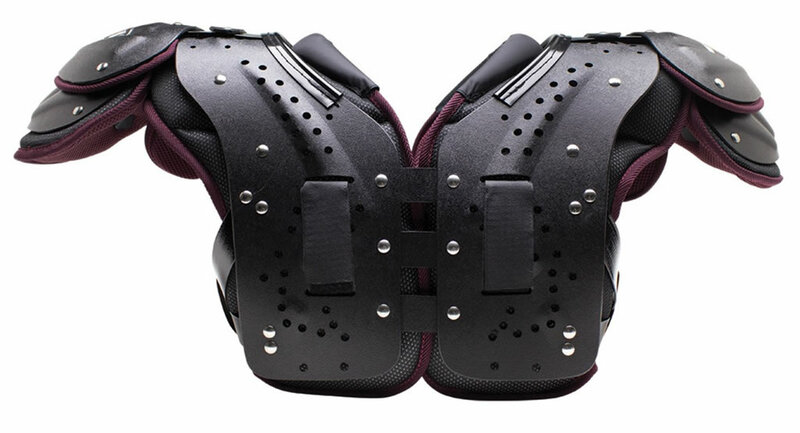 Why is it important to wear shoulder pads while playing football? Well, American football might be a wonderful sport, but it is also a dangerous one too. Because of the varied weights, sizes, strengths, and speeds of NFL players, you need to be appropriately equipped in order to prevent the risk of injuries. 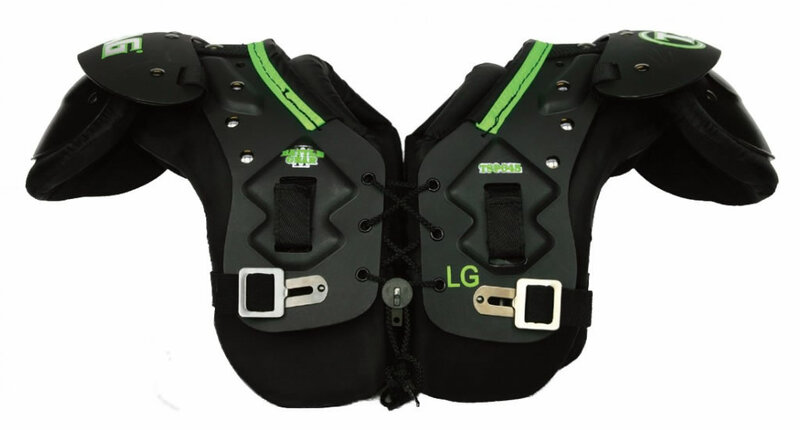 To help you on your shopping journey, we’ve narrowed down some of the best football shoulder pads for adults and youth that you can buy in 2018. 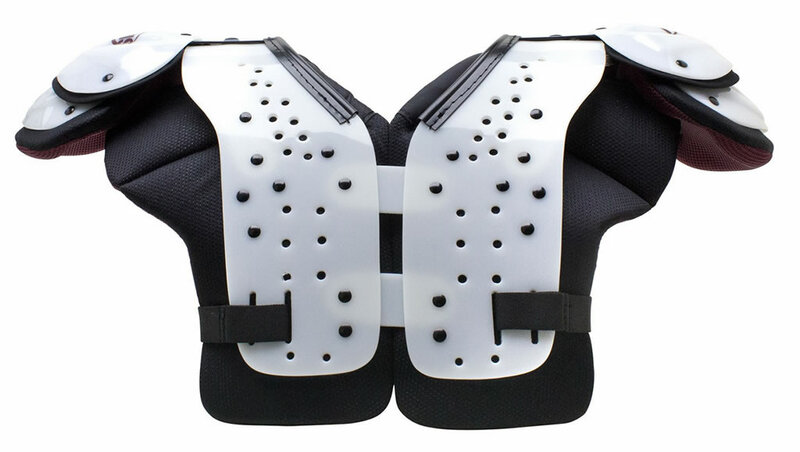 With everything under $100, you’ll be sure to find that right football shoulder pad on a budget. Enjoy! 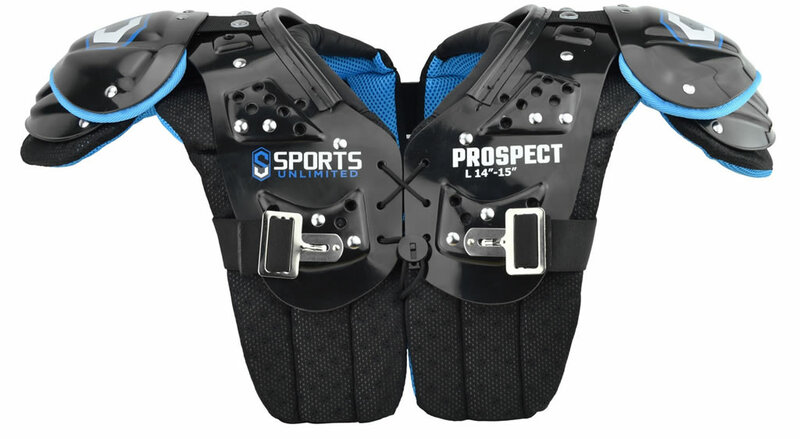 The Sports Unlimited Prospect model is an all-position youth shoulder pad that features an extended body length with double layer EVA foam for protection, as well as strategically placed 7mm vent holes for added ventilation. For strength and durability, the arch features raised corrugations, while the elastic straps provide a tight and snug fit. The antimicrobial treatment prevents growth of mold and bacteria, while the flat pad design supports incredible freedom of movement. 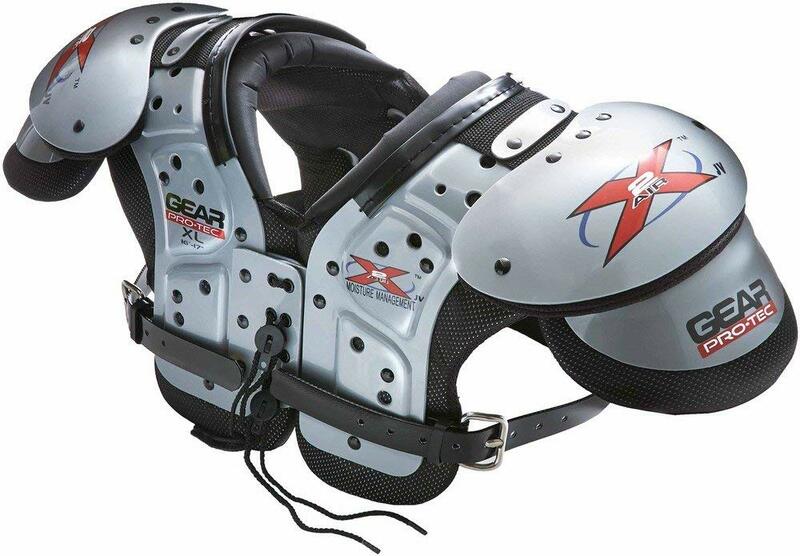 The Gear 200 X2 AIR J.V.-F shoulder pads are designed for linebackers, tight ends, defensive ends, and linemen, and they feature adjustable Air Release foam clavicle pads with 3 layers of high-density foam and molded-in reinforcement. There’s also a non-stretch strap system, as well as a Pro-Loc epaulet 180-degree that delivers just the right amount of mobility, weight, and impact absorption. The low-profile flat construction is also present, as are the vent holes that offer superior moisture management. 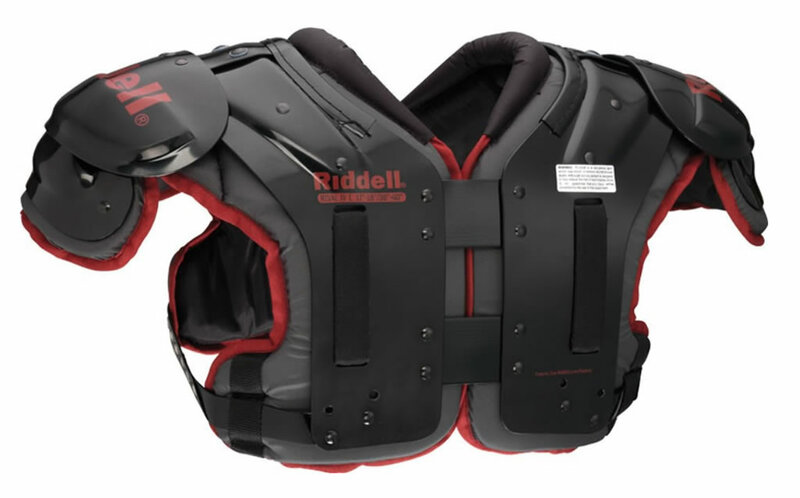 Specially designed for high performance at all positions for youth players, the Riddell Rival JV uses integrated deltoid pads with a flat pad design that offers amazing protection. The corrugated epaulets and streamline caps allow full mobility without losing protection, while the removable liners makes it extremely easy to clean. 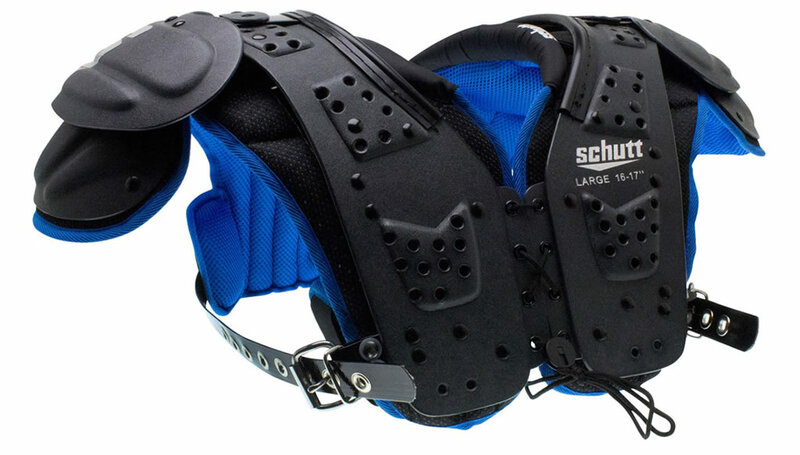 These adult football shoulder pads from Champro incorporate the Shockwave Tech System that disperses energy through shoulder corrugation ridges while maintaining the shape of pad. The low-profile design doesn’t inhibit the wearer’s movement, while the low-profile neck opening provides a perfect fit. 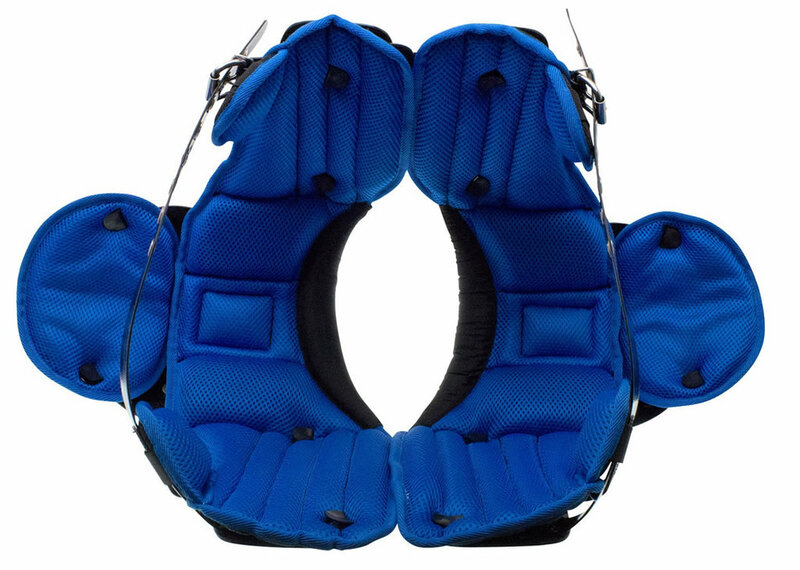 The hook & loop attachment system is also quite important, as are the integrated front deltoid pad, the accessory attachment points for a backplate and neck collar, and the reinforced arches. 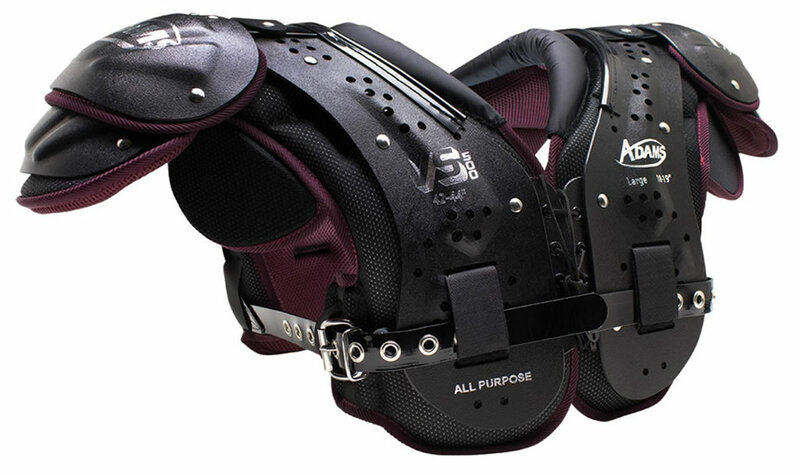 This offering from Schutt features an upgraded padding and a durable all-purpose arch that ensures a full range of motion. This product also has a high-impact, dual-density EVA foam for impact absorption, as well as 7mm vent holes for added ventilation and cooling. The body cushion is fully ventilated, and it is treated with a special antimicrobial agent in order to limit the growth of mold and bacteria. We should also note the stainless steel hardware and BIOTHANE belts. 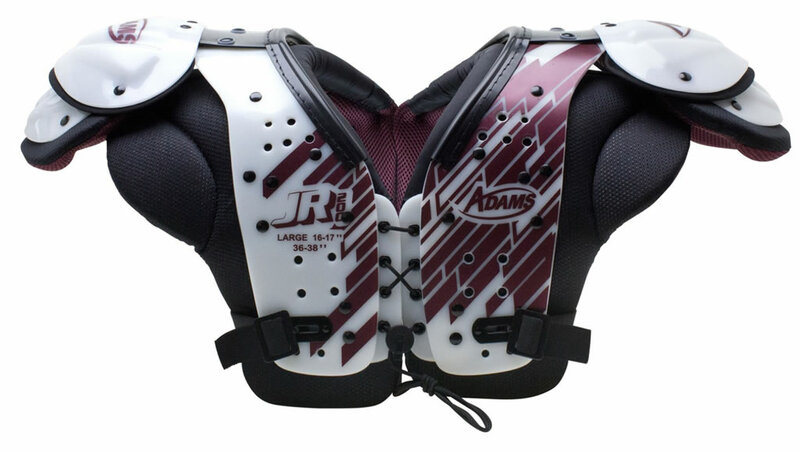 Moving on to an Adams product, we’ll tell you about the VS500, which is an adult football shoulder pad for lineman, linebackers and fullbacks. The ventilated body cushion helps prevent overheating, while the antimicrobial pad treatment offers protection against damage from mildew stains, bacterial odors, and mold. 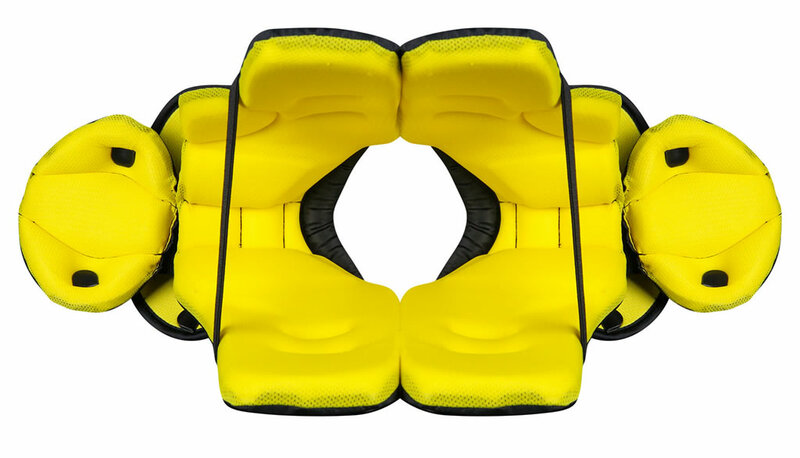 Last but not least, it comes with integrated scapula pads that improve overall comfort while supporting a customized fit. 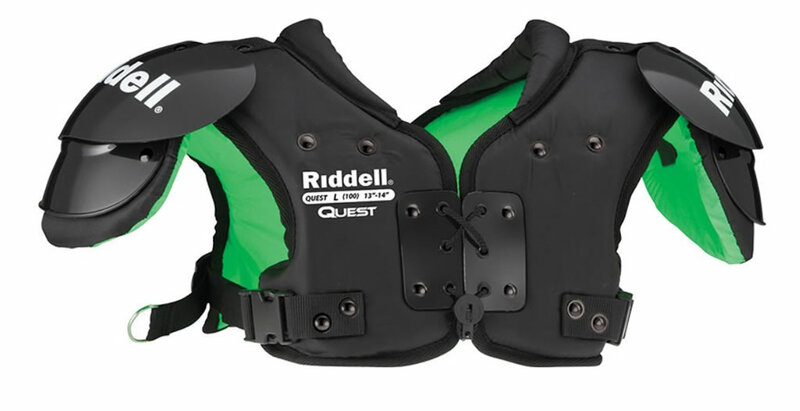 The Riddel Quest youth football shoulder pads promise to deliver plenty of protection to very young, entry-level football players. 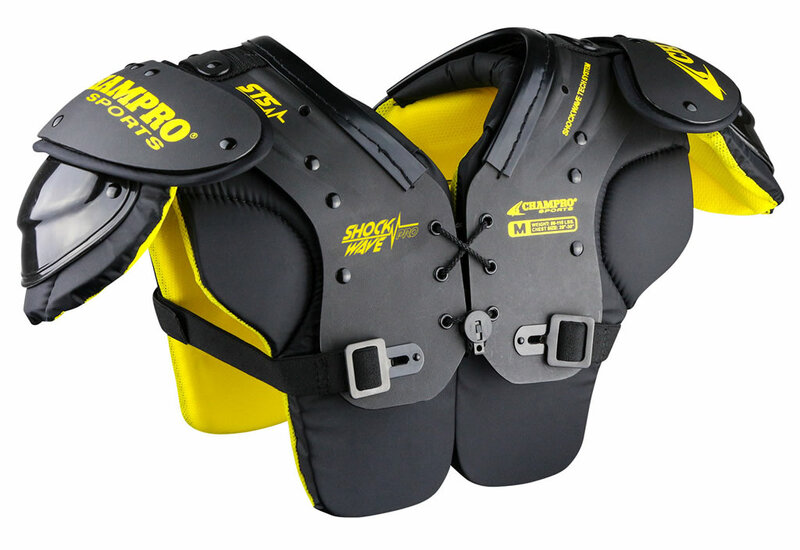 Lightweight and tough, these low-profile football shoulder pads have a Z-Fit easy-fit belting system, which can be adjusted for a perfect fit. They boast a soft-shell padding construction that absorbs impact, as well as dished epaulets, which ensure exceptional shoulder protection. 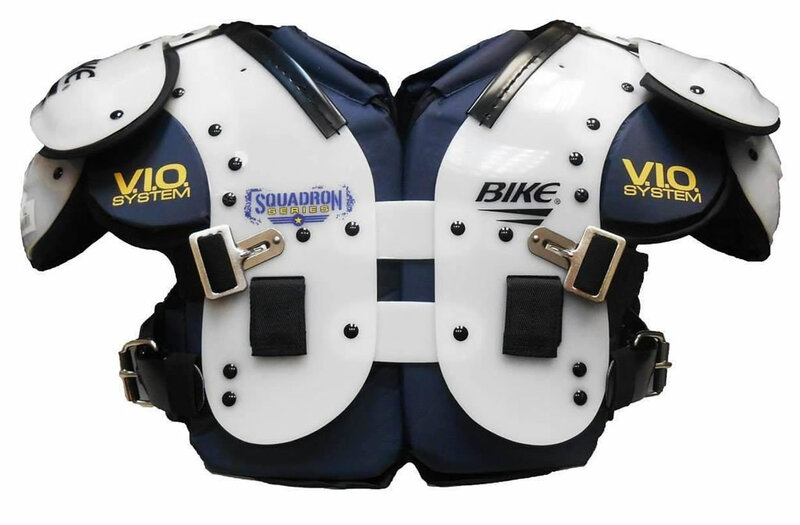 Another All-Purpose model, Bike Adult Squadron Series is recommended for Offensive and Defensive Line, including Tight Ends. 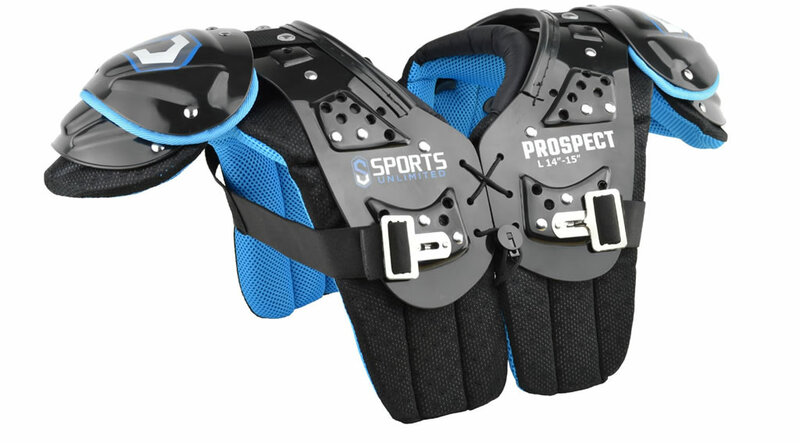 Available in sizes ranging from S to 5XL, these cheap football shoulder pads boast the Velocity Impact Optimization gel padding in the shoulder and front deltoid pad for maximum protection. The flat pad design also deserves a mention, of course, as does the air management system. 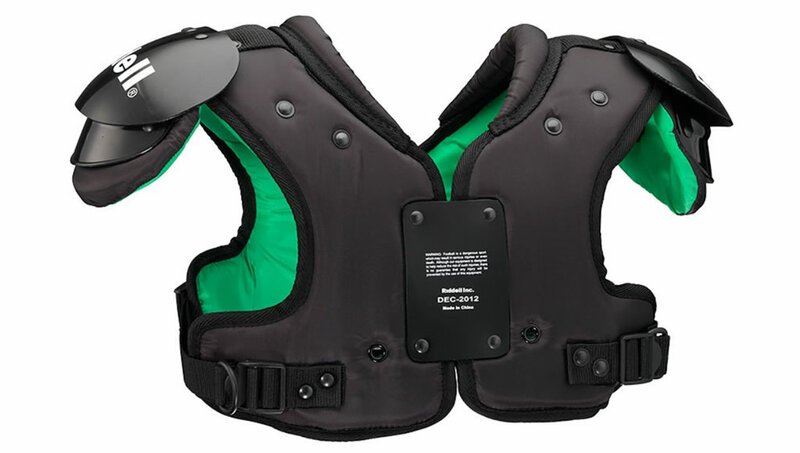 These men’s football shoulder pads by Adams flaunt a low-profile cantilever construction that delivers maximum protection without cutting down on mobility. The 7mm vent holes allow cool air in and hot air out, while the EVA impact foam makes sure that you do not feel the impact during the game time. The last offering on our list is from TAG, and it was named Battle Gear II. 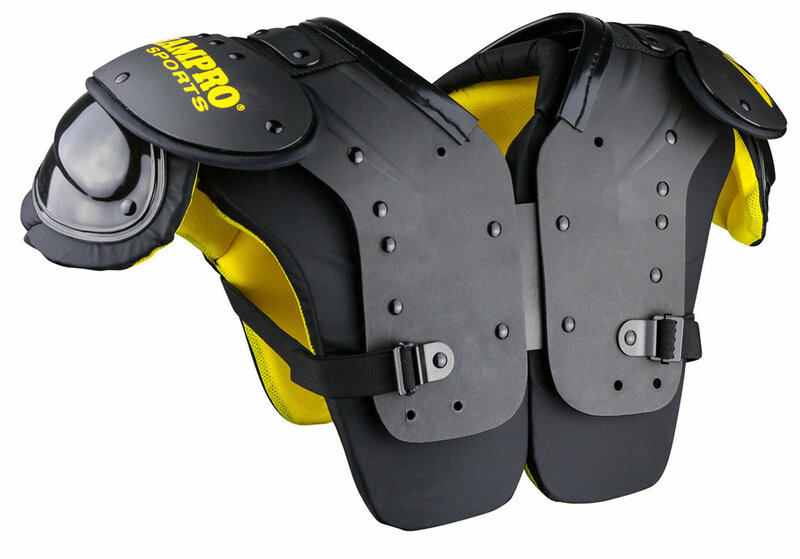 Designed to offer maximum protection, mobility and comfort at a lower price, these youth shoulder pads are available in sizes ranging from 2XS to 2XL, and they feature a loc-down strap and t-hook for a secure fit. 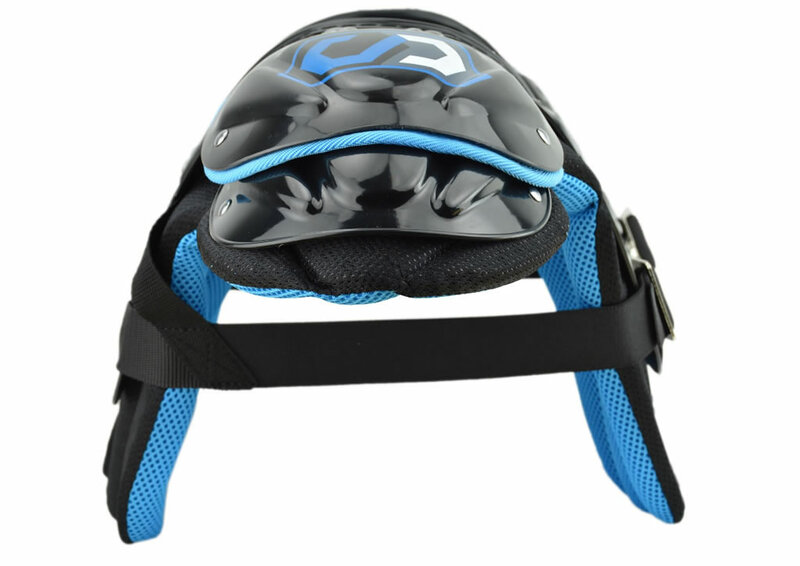 The adjustable Velcro neck opening allow the players to remove the gear with ease, while the HDOC arch padding construction with EVA foam on the shoulder areas provides complete protection. 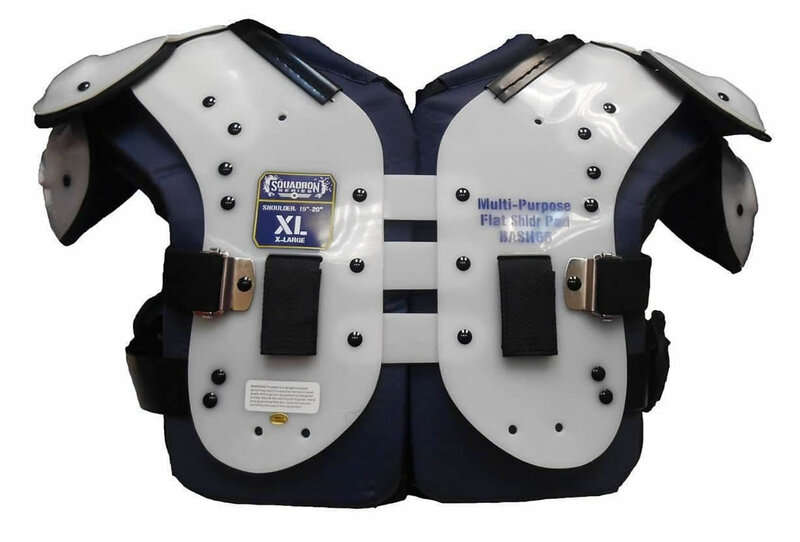 Furthermore, the pads have pre-drilled holes for neck rolls and back pads accessories, as well as an antimicrobial lining that is machine washable. 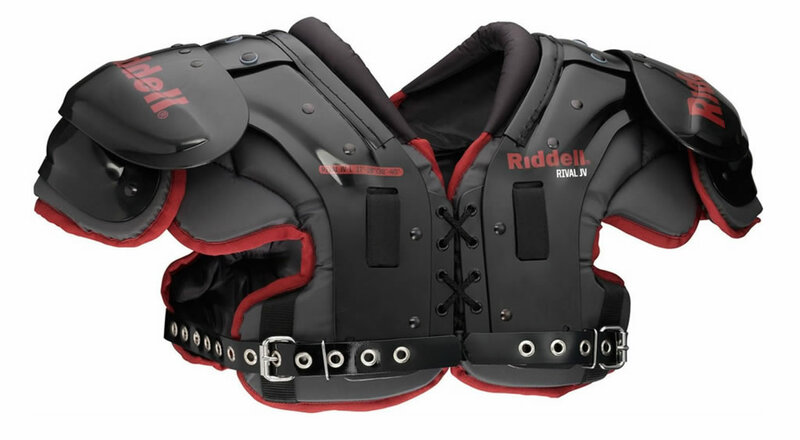 Which of the 10 football shoulder pads from today’s post are you going to try? Let us know by leaving a comment below right now.